For students seeking to enroll in health and fitness courses directly for credit, Carone Learning offers cFitness Academy, our accredited online school specializing in health, fitness, and career courses. Students who enroll with cFitness Academy take high-quality health and fitness courses and transfer credit back to their diploma-granting school. cFitness Academy is accredited through AdvancED. Enrolled students receive course credit directly from cFitness Academy. 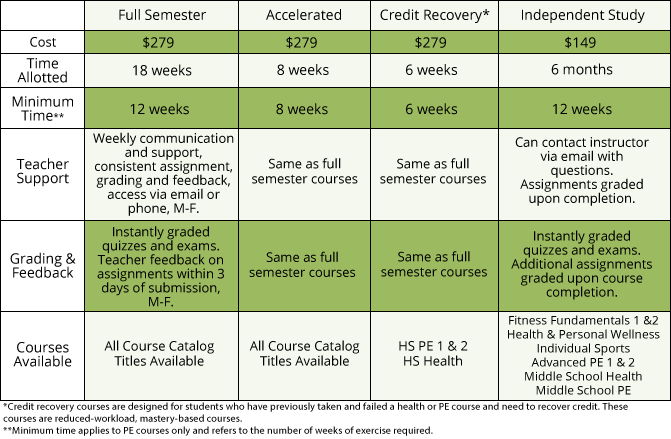 Health and fitness courses are one semester in length and equal 0.5 credits (equal to 5 units in CA). All courses are delivered asynchronously, meaning there is no set class time. Students work at their own pace… anytime, anywhere. Each registration includes guidance and feedback from a certified cFitness Academy teacher. cFitness Academy provides 70 health, fitness and career courses for students in grades K-12. There are several course models available. For a full course listing, see our Courses page. Students taking courses from cFitness Academy can take each course at their own pace. However, it is recommended that students work on their course on a consistent basis. For PE classes, fitness logs must be completed weekly. In each course, students will watch content videos, complete relevant assignments and quizzes, and participate in threaded discussion boards and/or journal entries. PE students must also complete 3-4 hours of physical activity weekly. A doctor’s note is required for students unable to complete all the required physical activity for PE courses, and alternative options or modifications should be discussed with the instructor at the beginning of the course. Students must have Internet access and a basic understanding of online technology and word processing applications. Learn about additional technology requirements. Learn about cFitness Academy policies. cFitness Academy is accredited through the NorthWest Accreditation Commission, a division of AdvancEd. Students will receive an electronic completion certification upon finishing a course. Official credit and transcripts can be obtained for an additional $25 transcript fee. Click here for more information on transferring credit to your school. For further information about course set up and completion, consult our student/parent FAQ page or contact us. Please look here for contact information for additional student support questions. You can register for a cFitness Academy course by clicking on the ENROLL NOW below and completing the requested information. Credit card information is required at the time of registration. Registrations are processed within 24 hours, Monday-Friday. Once your registration is complete, you will receive login information, as well as an introductory email from your instructor. Course drops within one week of registration will receive a full refund, minus a $25 processing fee. No refund is available after one week following registration. For returning students who would like to enroll in another course, please note that you must register through the student account, not the parent account. For students registering for multiple PE courses, please note that only ONE physical education course may be taken at a time. All fitness logs for one course must be completed before beginning a second PE course. Accelerated PE courses require a minimum of 8 weekly fitness logs.